Hatters midfielder Jonathan Smith has been praised for his impact since coming back into the team by manager Nathan Jones. The 29-year-old had been more a less a regular under previous boss John Still, but despite starting Jones’ first three matches in charge, was then dropped to the bench for five games. He was was back for the 1-0 win over Morecambe though and kept his place at Leyton Orient last weekend too as Jones said: “Smudger’s an important member of what we do here. He knows the club, we know what get from Smudger all the time and he’s come back in and done really, really well. “It’s been a team performance because every single one of them has had to contribute in every game for us to get a result. 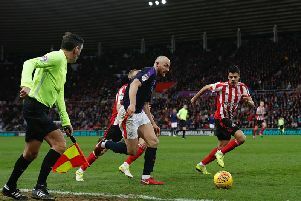 Meanwhile, captain Scott Cuthbert was another who looked back to his best at the weekend, with a commanding performance against former side Orient, as Jones added: “He’s been excellent for me since I’ve come in. He’s learning as well, because he’s at a good age to learn and to develop, and he’s doing that. “He’s led by example, wanted to train, trains fantastically well, he drives people on so he’s been a good captain for me. “I’ve found him excellent to deal with and I’m not aware of any critics that he had but I would imagine that a lot of them would have had a few critics with a few results they may have had early on. “But we can’t affect that and we’re not looking to affect that. We’ve asked for a positive reaction from them and since I’ve come in I’ve got that near enough all the time and even when we did have a setback we recovered from that, which is pleasing.